Sydney heats up in the summer months, December to February, making this the best time to soak up Australian beach culture and explore stunning nearby scenery such as the Blue Mountains. It’s also a time of great cultural activity and seasonal festivities, making summer one of the best times to visit Sydney. Here are a few ways to enjoy it. See the city’s top sights in a short time on a morning or afternoon sightseeing tour. Learn to catch some waves with a surfing lesson on Bondi Beach. Save money at top attractions and create your own itinerary with the Sydney Attraction Pass. Explore the natural beauty of the UNESCO World Heritage–listed Blue Mountains on a day trip with river cruise. See Australia’s diverse animals in their natural habitats on a 4WD wildlife tour. Explore Australia’s oldest wine-producing region on a Hunter Valley wine-tasting tour. Celebrate the season as you soak up the sights of Sydney Harbour on a Christmas Day lunch cruise. Hear opera singers perform arias and get a from-row view of Sydney’s fireworks at the New Year’s Eve Opera Gala at the Sydney Opera House. Enjoy a festive meal while sailing through the harbor on a New Year’s Eve tall ship dinner cruise. Ring in the New Year with a 6-course meal and unrivaled fireworks views at Sydney Tower 360 Bar and Dining. Enjoy a memorable New Year's Eve celebration at the Sydney Opera House with a ticket to the Opera Gala, an elegant evening of opera classics performed by Australian and international artists. The Opera Gala puts on a world-class selection of arias and other favorites, and the intermission is timed to coincide with the 9pm fireworks show. Audience members can watch Sydney's famous fireworks display from a superb vantage point right on Sydney Harbour, which provides incredible views of the colorful festivities. Learn the art of surfing with a lesson from a qualified instructor at world famous Bondi Beach, just a short hop from central Sydney. Get an informative and fun surfing lesson with your expert instructor, who shows you the basics, including getting up on the board, reading the surf and catching waves. If you want advanced instruction, private lessons accommodate all levels of expertise. Add a great workout and some waterside excitement to your vacation with a private or small-group surfing lesson in the heart of Australia’s surf culture. Celebrate the coming of 2019 with a sublime New Year's Eve performance at the Sydney Opera House. Opera Australia performs La Bohème, a story of six friends during a Paris winter. 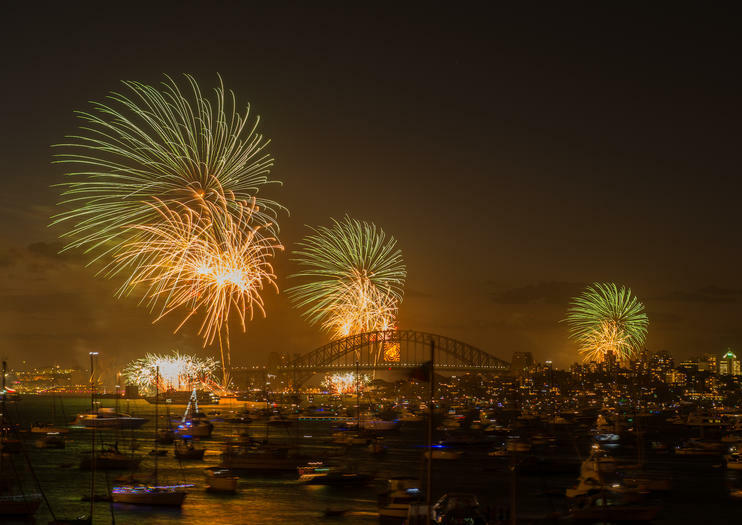 Enjoy a special New Year's Eve bonus as the intermission coincides with the 9pm fireworks show that takes place over Sydney Harbour, allowing you to enjoy front-row views of the fireworks lighting up Sydney Harbour Bridge and the skyline. Start the new year in style with this special performance at the Sydney Opera House. Celebrate Christmas day with a 3-hour lunch cruise on Sydney Harbour. View iconic sights such as the Sydney Opera House and Sydney Harbour Bridge as you enjoy a buffet Christmas lunch that includes beer, wine, and soft drinks.